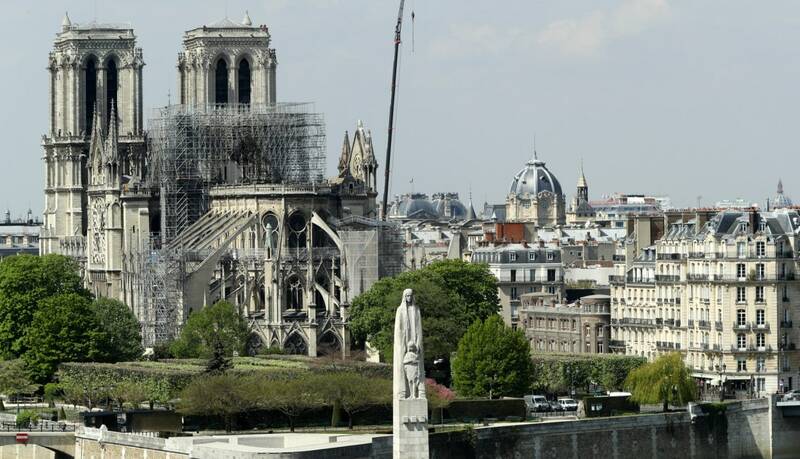 Monday news broke that a devastating fire had ravaged France’s beloved Notre Dame Cathedral, destroying crucial parts of the structure and leaving the building exposed to the wind and other potentially damaging outside elements. Now hold on just a cotton picking minute. Did Sarah Huckabee really fix her mouth to say Trump’s administration is sending over a bag of money to France in an effort to support freedom of democracy and religion? The same administration that wanted a Muslim travel ban and put Mexican children in cages after ripping them from their families at the border? I’m not sure that’s how freedom of democracy works. There’s no doubt that the destruction of a historic landmark is grounds for sadness and what not, but as a Black person (or any person of color really) living in America it’s really hard not to give this unified outpouring of support and cold hard cash — for a building — the side eye, given all the other more pressing tragedies surrounding us in the global Black Diaspora that have yet to attract even a fraction of the same support and resources. While the world collectively mourned a fire that partially destroyed Notre Dame, three Black churches in Louisiana had been burned down just weeks before within a short period allegedly by a suspect charged with hate crimes, and barely make a blip on same media outlets prioritizing coverage about the cathedral. This was the first strike that made it hard for a lot of people in Black media to get swept up in all the “outrage” being directed towards France this week. Before Ali pointed out the glaring contrast of how the Black religious institutions had been dismissed after a targeted, hate filled attack vs the overwhelming cash flow being sent to Notre Dame, the churches’ GoFundMe had only raised a little less than $160,000 of its one million dollar goal. However, after thousands of likes and retweets, Black Twitter rallied together and gave an additional $300,000 in donations in under twenty four hours for the rebuild efforts and the donations continue to pour in. I’m not saying you can’t support anything mainstream without supporting something Black first, but instead pointing out how this is yet another reminder of how white institutions continue to be treated as a priority over blatant attacks against Black people. As far as we know the Notre Dame fire was an accident, but police say those churches in Louisiana were literally attacked by a suspected neo-Nazi who was specifically going after a sacred space. That distinction matters. What about Puerto Rico and Flint? The cautious way Black people have reacted to the Notre Dame fire went from mild weariness to flat out annoyance after it was announced that America was pulling out its purse to donate a couple million to our homies over in Europe. Having allies is one thing, but if we had that kind of money lying around, why wasn’t any of it given to the residents of Flint, Mich., to get them sustainable clean water, or to the residents of Puerto Rico who were left to fend for themselves after whole communities — and not just half an old building — were destroyed? It’s incredibly hard for the members of those communities and other communities in this country just like them, not to see this as a direct slap in the face. When did replacing a church window in another country rank as a higher priority than making sure children have clean drinking water or that families get the assistance they so desperately need after a devastating Hurricane? And before anyone gives the, “Well we can’t help everyone,” speech let’s all be clear — if Flint was a predominantly white area the government would have made sure it had what it needed years ago. Historically, in this country, the racial and socio-economic demographic of communities have always had a heavy handed impact on how much money and assistance they get. Let’s not act brand new now. And as for Puerto Rico, aside from the aforementioned reasons, a part of me suspects it’s been left in the cold because our president is so slow witted, he still has a hard time believing PR is even part of the U.S.
That France was able to get over $700 million in a single day in response to the Notre Dame fire is impressive, but it also vexed Haitian-Americans and history buffs alike, who are all to aware of the way that France financially crippled Haiti as punishment for it becoming the first independent Black republic. Call me crazy, but sending even a penny over to a nation that intentionally robbed a group of slaves blind just because they had the nerve to seek freedom, doesn’t feel like a good move at this point in my life. And it seems quite a few people of color have the same point of contention. “Or the taxes they continue to collect from the African countries they colonized,” added another follower. “Or better yet the French bourgeoisie should start growing sugarcane (to rebuild the 700-year old Notre Dame) as the Haitians did who had an average lifespan of 21 years under French colonial rule,” interjected a third person. This one conversation brilliantly illustrates the frustration being felt by Black Americans who continue to see everyone (and every thing) being fiscally prioritized above us getting bare necessities like shelter and clean water. No one is saying they’re happy about what happened in Notre Dame, but support has to go both ways. The days of Black people rising up and supporting everyone else, without demanding the same in return are done.